Spring is in the air! I love Spring, it really is my most favorite time of the year. It’s not too hot, not too cold, blooms are everywhere and everything is beautiful and turning green again. 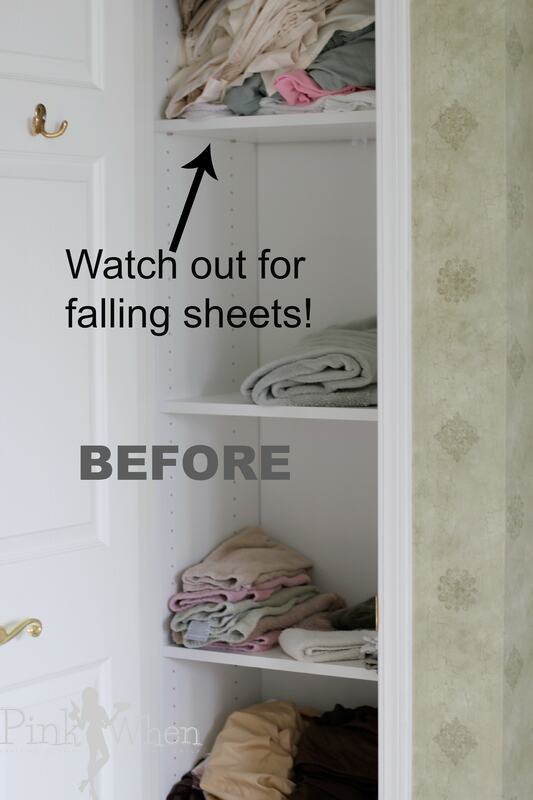 It’s also the time for Spring Cleaning and Closet Organization. Specifically for our bathroom linen closet. For some reason, every winter I lose my mind and just fold and toss. I have no idea why. Maybe it is because we are wearing so many winter clothes that I am concentrating on where to put clothing versus towels and the linen closet. This past weekend I opened up the closet and just said “NO!” How did I let it get this dreadful? I am usually so particular about how things are done and clean, I totally let this one go. Probably because I could easily shut the door and not see it again until I opened the door. Don’t have a heart attack when you see this BEFORE picture. I am ashamed to say, it’s horrible. The first thing I had to do was go through and re-fold those sheets and towels. Grr. It’s my nemesis to have to do something over, but this is crazy. I just want to simply have my closet organized and tidy and not get attacked by falling sheets when I open the door. 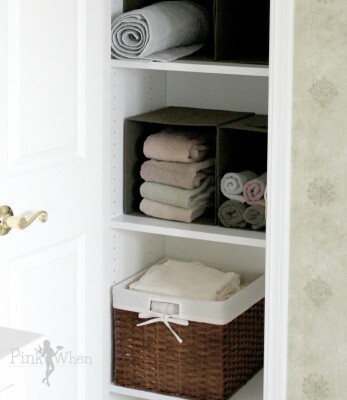 Solution: Linen baskets! I know, I know….I am late to the party. I should have done this a long time ago. In addition to the linen baskets, I also changed the way I folded my towels and bath clothes. They are all now rolled and save a ton of space. Not to mention, it definitely looks better. I won’t be ashamed if a friend comes over and opens up the door looking around. She will now be totally in awe, versus possibly attacked by the falling sheets and towels. This was such a quick and easy fix, and a very inexpensive one as well. I went to my local home improvement store and grabbed these in 2 packs for less than $7 a pack, and the larger wicker baskets for the linens were less than $10 each. Not a high cost for a little more organization in my life. Do your closets look like mine did BEFORE or AFTER? I think I am probably the only crazy closet lady, but I hope this little Spring Cleaning project inspires you for some Closet Organization, and more! I know what you mean, mostly because with all of the kids it never STAYS organized…at least in the kitchen. The bathrooms are rocking now! I have got to do this…I did a little over the holidays but since the new year started, it has fallen by the wayside. That’s is usually what happens at my house too….it all falls to the side…but I am determined this will stick. See, your before photo is what happens when I put away the sheets and towels. The after photo is what happens when Cassidy does it. Not yet! But I may do one soon…the problem with laundry is that I wash, dry, fold….but I am TERRIBLE at putting it all away….so I have a couple of stacks on my dresser. I actually put MY clothes away…but I don’t put anyone else’s clothes away, Ha! Sharing this on fb today. Thanks for the great tips!! What a great idea to use linen baskets! It’s such a great way to organize and they are super cute. I have been planning on tackling the closet in my bathroom and I think I need to go get some linen baskets.